OUR MISSION: THE PENTAGON IS SPENDING $63 MILLION DOLLARS TO GLORIFY OUR UNNECESSARY, UNJUST, AND IMMORAL MILITARY ACTIONS IN VIET NAM AND IN OUR CONTINUING WARS TODAY. OUR MEMORIAL EXHIBIT HONORING THE VIETNAMESE WHO DIED IN THEIR AMERICAN WAR IS A STRONG, ANTI-WAR RESPONSE TO THE PENTAGON’S CAMPAIGN. 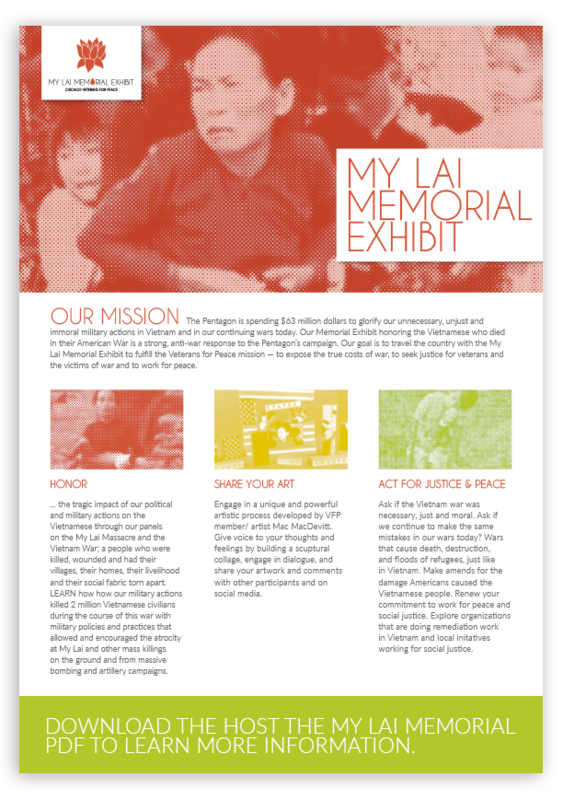 OUR GOAL IS TO TRAVEL THE COUNTRY WITH THE MY LAI MEMORIAL EXHIBIT TO FULFILL THE VETERANS FOR PEACE MISSION TO EXPOSE THE TRUE COSTS OF WAR, TO SEEK JUSTICE FOR VETERANS AND THE VICTIMS OF WAR AND TO WORK FOR PEACE. FORTY PLUS INFORMATIONAL PANELS TO HELP THE EXHIBIT VISITOR UNDERSTAND THE VIETNAMESE AS A PEOPLE AND THE IMPACT OF THE AMERICAN WAR ON THEIR FAMILIES, THEIR LAND, AND THEIR WAY OF LIFE. AN ORIGINAL VIDEO “I ALWAYS SAW THEM AS HUMAN”: U.S. ARMY TIGER FORCE VETERAN DENNIS STOUT BRINGS YOU ALONG WITH HIS UNIT AS THEY MOVE THROUGH SMALL VILLAGES NEAR MY LAI IN 1967. LEARN FIRSTHAND OF THE PAINFUL CONSEQUENCES OF OUR MILITARY ACTIONS ON VIETNAMESE FAMILIES IN THE NORTHERN PROVINCES OF SOUTH VIET NAM. INTERACTIVE SCULPTURAL COLLAGE BUILDING AND DIALOGUE: AT THE HEART OF OUR EXHIBIT, ENGAGE IN A UNIQUE ARTISTIC PROCESS TO CREATE SCULPTURAL COLLAGES. DIALOGUE WITH A TRAINED MENTOR AND CONNECT WITH WHAT WENT ON IN VIET NAM WITH YOUR FEELINGS ABOUT HOW WE USE VIOLENCE IN OUR SOCIETY AND IN THE WARS WE ENGAGE IN TODAY. SHARING WALL: DIGITALLY SHARE IMAGES OF PERSONAL COLLAGE ART AND COMMENTARY WITH OTHER EXHIBIT PARTICIPANTS AND POST ON YOUR SOCIAL MEDIA. AN OPPORTUNITY TO READ AND SIGN AN OPEN LETTER TO THE VIETNAMESE PEOPLE THAT WILL BE DELIVERED TO THE MY LAI MUSEUM IN VIET NAM. SATURDAY AFTERNOON DISCUSSION AT 1:00PM OF ERIC HERTER’S UPCOMING FILM “ VOICES FROM THE OTHER SIDE: WAR AND PEACEI N VIETNAM AS TOLD BY THOSE WHO LIVED IT.” A TEN MINUTE TRAILER OF THE FILM WILL BE AVAILABLE FOR VIEWING. SATURDAY EVENING READING AT 7:00PM FROM TWO COLLECTIONS OF “LETTERS TO THE WALL” LETTERS WRITTEN TO THE VIETNAM VETERANS MEMORIAL OVER THE PAST FOUR MEMORIAL DAYS. SUNDAY AFTERNOON CLOSING CEREMONY AT 1:00PM.